Dimensions: approx 1.8" x 1.05"
These handy adapters make the use of DB15 High Density connections in prototyping projects much easier. 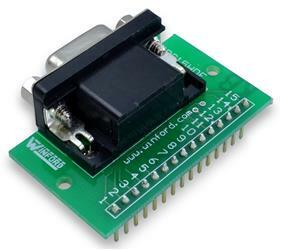 They are designed to quickly and easily mount a DB15HD connector onto a breadboard circuit, but they are also very useful as a permanent part of a perfboard circuit. Odd pin spacing on D-Sub connectors typically makes use of a DB15HD connector on perfboard difficult and awkward. These adapters solve that problem by providing a standard 0.1" pin spacing, giving you a much cleaner result. The individual pins on each adapter are numbered according to the appropriate DB15HD connector pinout. Adapters are available with both male and female DB15HD connectors. They are also available with other styles of connectors, including the standard-density 2-row DB15 connectors. Have one of each in your tool box. Technically, the correct term for a DB15 High Density connector is DE15, but that term is not commonly used.